Heeft u een vraag voor Putheavatei Boutique Hotel and Spa? 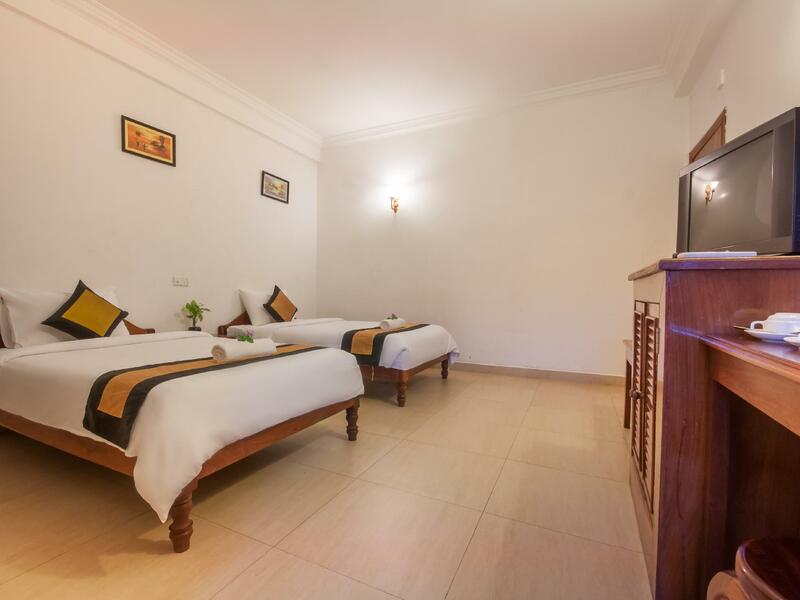 Putheavatei Boutique Hotel and Spa, gebouwd in 2011, is een aanwinst voor Siem Reap en een slimme keuze voor reizigers. Het hotel ligt niet zo ver van het stadscentrum: de afstand is ongeveer 2 km en het duurt normaal ongeveer 15 minuten om het vliegveld te bereiken. Dankzij de praktische locatie liggen alle belangrijke trekpleisters in de buurt van het hotel. Profiteer van de ongeëvenaarde dienstverlening en voorzieningen in dit hotel in Siem Reap. Het hotel biedt 24-uur roomservice, gratis wi-fi in alle kamers, 24-uur beveiliging, dagelijkse schoonmaak, openhaard om gasten een maximaal comfort te garanderen. Aanvullend beschikken alle gastenkamers over een variëteit aan voorzieningen als internet (draadloos), draadloos internet (gratis), rookvrije kamers, airconditioning, wekservice, om zelfs de meest veeleisende gast te tevreden te stellen. Het hotel biedt een uitstekende variëteit aan recreatieve faciliteiten, inclusief golfbaan (binnen 3 km) , massage, tuin. Ontdek een boeiende mix van professionele dienstverlening en een breed scala aan faciliteiten in het Putheavatei Boutique Hotel and Spa. The hotel rooms are quite simple for European standards but had everything we needed. Unfortunately it had No warm water. The staff is very nice though and try really hard. There was a power outtage all over SR when I stayed at this hotel. The owner was very helpful althroughout my stay. I also appreciate all the help and assistance I got from Ponleu, the hotel's designated tuktuk driver. The hotel is one of the closest ones to Angkor wat and that's why i booked it. The room i had had dirty walls and gelt almost like a cell without windows. There weren't even bed lamps. Breakfast is pieve of toast.and omelette, nothing to mention really. Staff performance wasn't too good either. Not up to a 3-star standard. Staffs are friendly and try to help out when special arrangement was requested. The rooms are spacious and the beds are comfortable. During our stay in Putheavatei Hotel, we felt that the staffs are friendly and willing to help with some of our needs. However, two of the toilets in their rooms couldn't flush properly but they fixed it after we have reported to them. They are quite hardworking to clean up the room everyday but they have mistakenly threw away some of our belongings and also some of them were placed on the floor while they should have kept on a cleaner place (table or bed). Furthermore, they haven't replace their broken electronic devises and we were unable to use. The breakfast provided were yummy but it was too slow even we have tried to place the orders in the earlier time (more than 30 minutes). This has delayed our journey and our driver had to wait us outside the hotel. Their response to email is not sensitive enough and led to miscommunication. Overall, this is a cheap place to rest and get ready for the next day trip. And it would be more convenient if the services mentioned above could be improved in the future. Thanks to all the staffs that had served us well most of the time during our stay in Cambodia. Very clean rooms. No windows in some. Ask for front if u need windows. Location, value for money and friendly staff! The room was clean and the hot water is VERY hot which I enjoyed because that is what you'd be dying for after a whole day of temple visiting. The owner, MR. Phirun is extremely friendly and helpful. 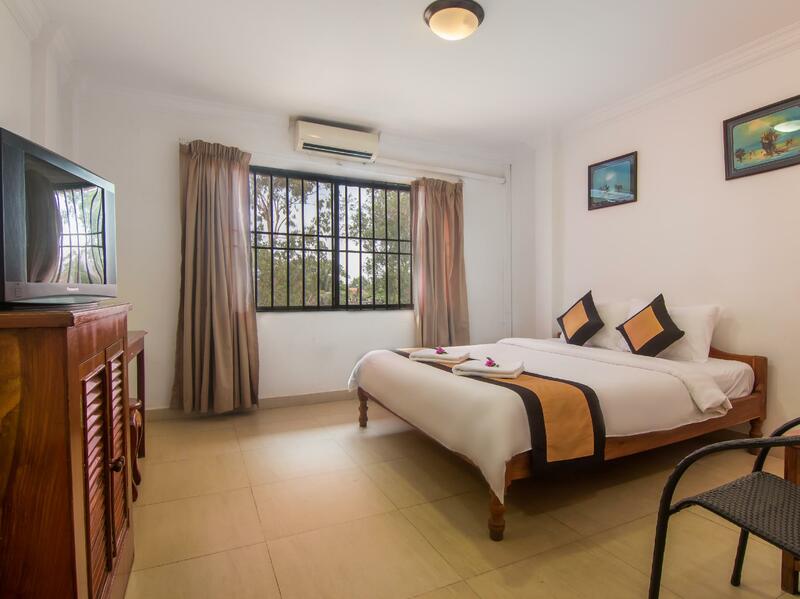 And the location is just 10 mins away from Angkor Wat, 15 mins from the Pub Street and 25 mins from Airport. I highly recommend this place! I enjoyed my stay at this location and found the staff extremely enjoyable. My only note would be to consider the flights of stairs required to arrive at your room; there is no elevator. If you unable to climb stairs, this would be a drawback, otherwise I heartily recommend their service and accommodations. Agoda: I already wrote a review and submitted it. But when I checked the hotel's Web page, my review's not on it. And when I logged into my Agoda profile, found out I still haven't done a review of this hotel. Please, please, please, Agoda, can you make your interface efficient? We take the time to do these reviews, but you make it difficult for us. Please do something about this!!! We're busy people. We can't rewrite reviews all the time!!! Do you expect us to rewrite everything??? Please!!! A pleasant stay, which was improved by the helpful and friendly staff who helped us organise a number of activities including the sunrise tour of Angkor.